Easter weekend was spectacular in the northeast, and three of us were out on the Hudson River with the Open 60s, Estrella Damm, and W Hotels. 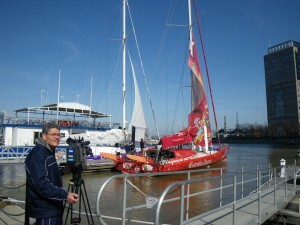 The boats are here in New York in preparation for a match racing record run from Ambrose Light to Barcelona. The boats are “Open,” as in “pretty much anything you want to do within a measurement box you can try.” That means that there are tweaks and pinches and custom fittings and systems galore. I would love to be on the boats and do two boat testing for weeks: Let’s see, if we go flaps up what happens? Both rudders down? Keels canted? Different combos of water ballast? Auto pilot vs. human on pilot? Rotating mast? Dagger boards up, down, middle? The combinations are endless. Ladi and Vlad were driving chase boats with photographers onboard. It was a great opportunity to see these machines up close and personal. We all were impressed with the acceleration out of the tacks. They slowed down like a big flat dish of a boat would when they went through the wind, but then it was like a train coming out of the station as they accelerated and the spray started flying. It was also only blowing about 8 knots! 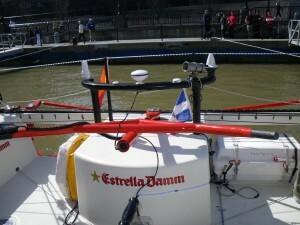 I was providing VIP commentary for the Estrella Damn boat. Both boats will be at North Cove until departure – maybe Wednesday night. We lost the 1st race to W-hotels in lighter wind. In the second race our start was better, and we were able to hold them off to a very close finish. With only two races, Estrella Damn won the day. 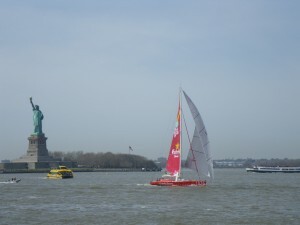 The real spirit though was one of community – NYC and Barcelona – as well as promotion for the upcoming Barcelona World Race, which is a double-handed round the world race. Maybe in the future of one of our Acorns? I will definitely get to North Cove to look them over….Thanks for the heads up !